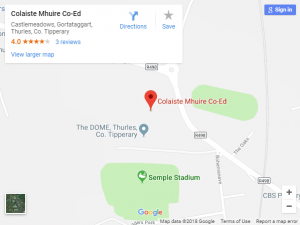 Coláiste Mhuire Co-Ed operates a 9 period day on Monday and Tuesday and an 8 period day on Wednesday, Thursday and Friday. Students are encoraged to be at school by 8.45am as morning registration takes place at 8.55am. After school study is also available for 2 hours every evening.